IBM Data Replication portfolio provides log based change data capture with transactional integrity to support big data integration and consolidation, warehousing and analytics initiatives at scale. It provides you the flexibility to replicate data between a variety of heterogeneous sources and targets. It also supports zero down time data migrations and upgrades. IBM Data Replication can also provide continuous availability to maintain database replicas in remote locations so that you can switch a workload to those replicas in seconds, not hours or even minutes. 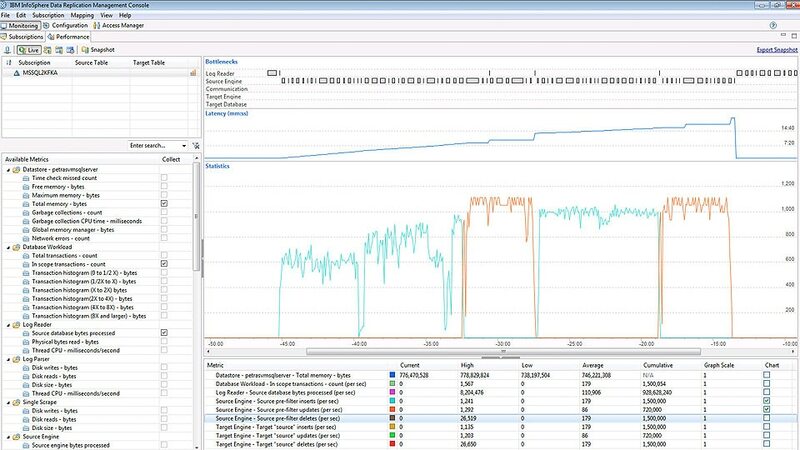 Gain visibility into the performance of your replication environment with central monitoring. Quickly perform deployment and data integration processes using the simple graphical user interface (GUI). To prevent costly downtime and productivity losses, software data can be synchronized between two systems to provide continuous availability and data delivery to support critical business operations. Change data capture technology allows you to easily capture from logs and deliver critical dynamic data in near real time enabling you to make proactive business decisions based on current events. By continuously moving small amounts of changing data, you can save on system resources and network traffic thereby saving operating costs.